The key to a good roasted cauliflower is getting it nicely browned before it gets too soft and loses its texture. Keep the heat high and don't open the oven while it's roasting. 1. Heat your oven to 220C (200C fan-forced). Trim the leaves from the cauliflower and place the whole head in a baking dish. Drizzle with the olive oil and season well with salt. Bake until well-blackened on the surface and just tender in the middle, about 45 minutes. 2. While the cauliflower is baking, mix the hummus, yoghurt, honey and lemon juice. Season with salt to taste. 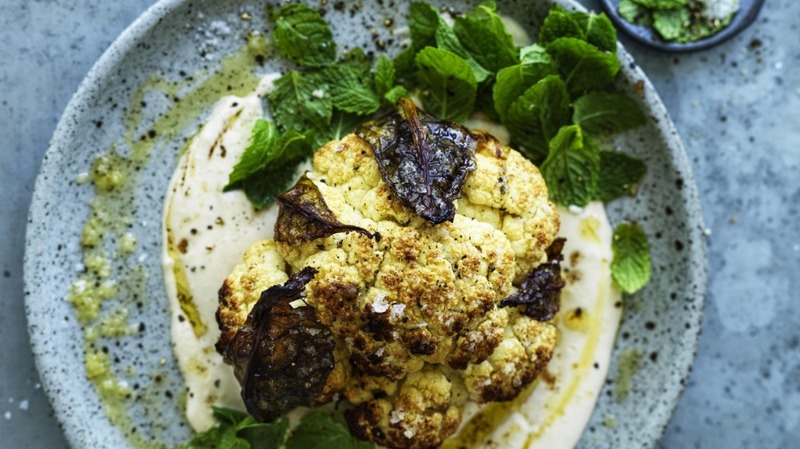 When the cauliflower is cooked, top with the hummus mixture and drizzle with a little more olive oil. Add black pepper to taste, scatter a few mint leaves on top and serve. Serve with Adam Liaw's good green salad recipe. Find more of Adam Liaw's recipes in the Good Food Favourite Recipes cookbook.